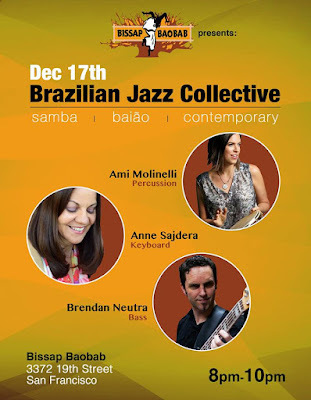 Jazz Station - Arnaldo DeSouteiro's Blog (Jazz, Bossa & Beyond): Brazilian Jazz Collective in SF, Dec 17th! Brazilian Jazz Collective in SF, Dec 17th! Come enjoy the lovely music to be performed by the Brazilian Jazz Collective, with Ami Molinelli (percussion), Anne Sajdera (keyboards) & Brendan Neutra (bass).